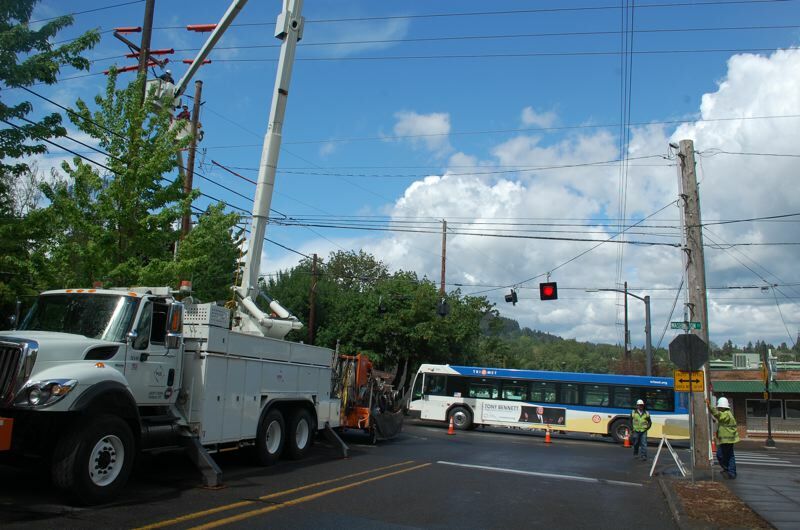 Oregon City's busy, hilly intersection at Washington and 12th streets — the location of frequent vehicle crashes — may get substantially safer with the installation of a new traffic signal. In addition to the traffic lights, construction is underway to prepare for new, four-way push buttons that will trigger pedestrian walk signals to help increase public safety. In 2014, a man was killed by a vehicle heading down Washington as he tried to use a crosswalk at the intersection. With people often disregarding the 25-mph speed limits and running through the stop signs for 12th Street traffic, it is the location of about seven motor-vehicle accidents annually. In response, Oregon City officials have frequently studied and criticized the intersection since at least the early 2000s. In 2003, the city completed some minor modifications to the area, increasing sight distance for vehicles through the installation of bike lanes and adjusting signage. Oregon City's traffic engineering consultant DKS Associates' comprehensive analysis of the intersection recommended that either a traffic signal or permanent restrictions to left turns be implemented. City officials set aside funding for a traffic signal during the last budget cycle. The $480,000 project will include removal of overhead flashing lights, re-establishment of the Washington Street bike lanes, and reconstruction of the curb ramps to be in compliance with the Americans with Disabilities Act. In order to install a new signal, some of the overhead lines and utility poles in the area are being modified. Traffic signal work will begin once the overhead lines and poles have been relocated, which currently requires intermittent closures of 12th Street and one-lane closures of Washington Street. City officials expect construction to be completed by the fall.